Sit back and watch as we walk you through many of the amazing features of the Band-in-a-Box® program. 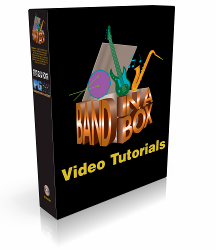 You′re bound to learn something with our Video Tutorial selection for Band-in-a-Box® for Windows! This great collection of Band-in-a-Box® tutorial videos created and produced by Team PG are the perfect way to learn how to get the most from your Band-in-a-Box®. Includes master guitarist Oliver Gannon′s "Songwriting with Band-in-a-Box®" and "Secrets of the Stylemaker" videos! With Oliver Gannon as your teacher, you′ll be composing your own professional quality songs in Band-in-a-Box® in no time! Buy and Download Now ! We don′t think that anyone is a bozo for having fun with Band-in-a-Box®, but we understand that there are lots of Band-in-a-Box® users, new and old, who want in-depth instructions on all that there is to know about this powerful and versatile program. In these instructional videos we′ll try to answer all of the questions we can think of, and we hope that you′ll help out by letting us know what we′ve missed. MIDI Driver Setup Window tour. Synthesizer ⁄ Soundcard Instrument list explanation. A tour of the DXi settings and Direct X Plugins window. Definition of Latency, and latency adjustment instructions. Tour of the Audio Settings window. How to fine-tune ⁄ offset Ms instructions. Selecting ASIO – a tour of the ASIO Audio Drivers window. Associating Band-in-a-Box® file types in Windows Explorer. Outlines the basic operation of Band-in-a-Box®. User Interface layout explanation (Status Bar, Synth Window, Toolbar, Title Window, Floating Custom Toolbar). Personalizing your interface using the Window menu. Display options – the Opt | Preferences window. Changing the colour of the Band-in-a-Box® display. Changing the settings at any bar. Tour of the Help Menu. Explanation of the Notation window, Editable Notation window, and Staff Roll Notation Mode window. Customizing the Notation window with the Opt. button. How to access the Audio Chord Wizard. Step-by-step instructions for importing and analyzing an audio file. Main screen tour – an explanation of the different commands available. Importing the results to Band-in-a-Box®. Explaining the Utilities window when importing the chords to Band-in-a-Box®. Explanation of different Audio file types – MP3, WAV, and WMA. Saving in different Audio formats. Step-by-step instructions on rendering your song. Rendering window tour – an explanation of all the buttons ⁄ commands within this window. Rendering with the Roland VSC, and installing the VSC. Step-by-step instructions on burning the audio files to disc using the MiniBurn program.